Organising a corporate event or an office party in the Sydney CBD soon? Looking for one-stop party hire around Sydney CBD? How about a complete party hire company in Sydney CBD to help you make your event grand, without the stress of handling multiple party vendors? How about Walkers Party Hire? Walkers Party Hire is a one-stop marquee, event and party hire service with branches across Sydney; providing marquees and marquee accessories including party equipment like furniture, flooring, lighting, interior decor, crockery, glassware, heaters, air conditioning, and much more to make your event complete and grand. With our Eastern Suburbs branch at 111 Beauchamp Road Matraville, we cater to the whole of Sydney Central Business District (Sydney City CBD). And the fact that Sydney CBD is home to some of the largest corporate giants, it is our favourite hot spot for corporate events. We have had the pleasure of facilitating some of the most memorable events of Sydney CBD, including shows, promotional events, exhibitions, product launches, fun days and many such events; having made corporate events successful for some of the largest Australian companies. Knowing corporate events requirements like we do, we go an extra mile by carrying a lot of extra items like a stage or podium for the speaker, steps or wheelchair access, a lectern, a whiteboard for a presentation, a small PA system, partitions, tea or coffee equipment and more; to make it a success. See what our customers say. Also, since Sydney CBD has a large concentration of cultural institutions, we have been lucky enough to cover all events from small to big, from backyard parties to outdoor hotel weddings, fun days, game events, birthday parties, weddings, balls, anniversaries, exhibitions, to name a few. There’s always something on. Our strength is our team of experienced professionals, willing to do their extra bit to make things easy for you. We deliver what we promise, on time, at your location, before and after the event. 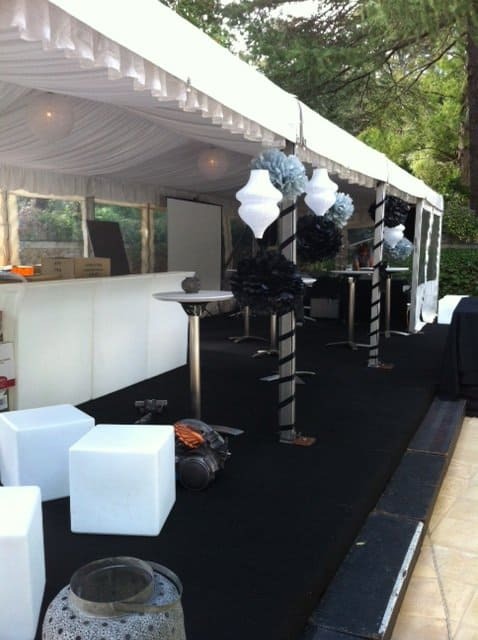 And, our party offerings are all good quality, safe, sound products, that won’t let you down in front of your clients. So, the next time you are planning an event in Sydney CBD, all you need to do is call Walkers Party Hire. We offer a free site consultation to give you the best ideas as per your location, number of people and nature of the event. We offer high-quality marquees of all kinds, shapes and sizes. Some of our popular marquee options being A-framed marquees, dome structures and pagodas in clear and white vinyl. We use high-quality German make marquees from the brand Hoecker (the market leader in marquees). Our marquees are beautiful, sturdy and waterproof; suitable for all grounds and fittings across Sydney CBD. We also provide Marquee Accessories to adorn your marquees for special events, such as clear walls, ceilings and wall linings. Our marquee accessories are as good quality as the marquee itself, they look and feel fantastic. 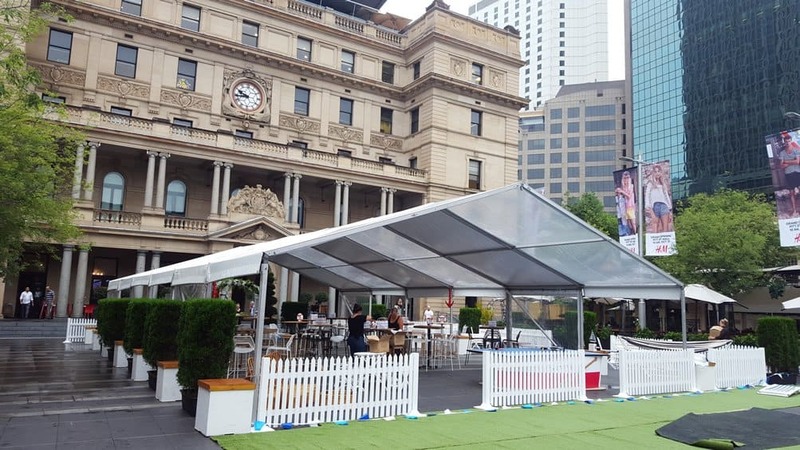 At Walkers Party Hire, we hire the most experienced and trained staff to make your marquees stand tall against unforeseen inclement Sydney CBD weather. Our people will guide you through the most fulfilling marquee hire experience. To give you the most enchanting festive experience, Walkers Party Hire offers a variety of hanging lights and decorative lights to make your party shine. We have amazing lighting arrangements to get the best out of your marquees. Our specialists make everything sparkle both inside and outside your marquee to give an enchanting experience to your guests, making them feel like they are dancing under the stars. From pom-poms to urns to flower arrangements, we have it all. We add a story to every event we touch, with our decorative arrangements. We make you stand tall by creating magic, be it on stage or for entrance, we offer it all. You can also get us to create bars and counters for your big event. We can have our party specialists suggest the best arrangements for you on request, at free of cost. And since we frequent Sydney CBD so often, we know our way around in relation to access, rules and regulations and parking. We provide all sorts of party furniture including tables, chairs, lounge furniture, bar stools, trestle tables, consoles, urns. We offer varied ranges and designs to suit all tastes and requirements; our conference chairs and projectors are among the favourites of Sydney CBD’s corporates. Our furniture is not only lovely to look at, but it’s comfortable and is made of good quality material. We are flexible about our furniture arrangements, to suit the size of your location, taking into account the number of guests you are expecting for your party. At Walkers Party Hire, we have an impressive array of tableware, dinnerware, crockery and cutlery to choose from. We make tables look pretty with our table arrangements, adding class and elegance to your party. As perfectionist as we are, we take into account the little details that make a difference to your set up. Our love for everything perfect, keeps us up to date with latest designs and decor, making us capable enough to make the finest arrangements possible. In the past, we have had the joy of creating the most enchanting table presentations in Sydney CBD. Reach us for a catalogue and pictures to choose from. Turns out, we are not only party specialists but also behind the scenes go-getters. We facilitate service by offering a variety of catering equipment from, trays to urns to blenders to food warmers to gas burners, and electric hot plates, deep fryers and turbo ovens. Our equipment is well kept and well maintained, exuding shine. With our experience and knowledge of Sydney CBD, we are confident of providing the best of catering equipment at any location in the CBD. Our party hire service is our pride, and we try hard to make it stand tall. At Walkers Party Hire, we can make any floor work. And we mean it when we say ‘ANY FLOOR’. We offer the best of wooden floorings, pool coverings, carpets, etc. We have the materials and flooring to make the most uneven surface smooth and flat. With Sydney CBD’s art, music and dance exhibitions at outdoor venues, we are accustomed to working on different textures of floors. Our life revolves around finding the best solution to all your needs, including flooring. Even though our marquees are warm and cozy, but with Sydney CBD’s extreme weather you may need heating for an outdoor winter event. Our heaters are hassle free to put and use, effective as hell. And just like our heaters, our air conditioners work just fine for Sydney CBD’s summers. So, go ahead, have your sunny afternoon party without having to worry about making your guests feel suffocated. All it takes is some props and accessories to add glamour to a party. So go ahead, make a wish, we promise to fulfil it to the best of our capacity. We offer everything under the roof, from vases to flowers to chandeliers to candles to pots to t-light holders, and much more to accessorise and beautify your party. Our collection of party accessories and props is in sync with latest trends and designs, making Sydney CBD sparkle and shine in the whole of Sydney. We make Sydney CBD happening! Yes, that’s what we do. At Walkers Party Hire, we facilitate the most happening events in Australia’s main financial and economic centre, as well as a leading hub of economic activity for the Asia-Pacific region- Sydney CBD. We are well versed with the routes, locations and climatic conditions of Sydney CBD; with our fleet of vehicles, we offer timely party assistance from our nearest branch in Matraville. Hence, we are your go-to party hire in Sydney CBD. Reach us by phone or email whatever suits you, or better, fill in our enquiry form to help us reach you. We promise to listen to you, to hear you, and to offer the best of party plans, tailor-made to suit your needs.